What to do, and more importantly what not to do. Winning duels in Rainbow Six isn’t just about aim. Being able to flick to headshots with your mouse is only one part of the equation. The other part involves fine-tuned restraint, awareness, and appreciation for tactics. Running headlong into firefights is a recipe for disaster. Know when to push, but also know when to hold back and wait for your opponent. Being good at Siege is a real test of your ability to be patient. These are some ways to develop that tactical patience and excel at one on one battles. 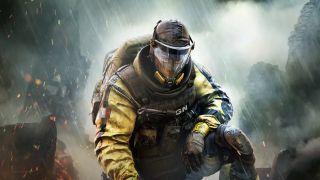 Rainbow Six is not a death-match game that rewards brazen and open conflict. We’ve written that Rainbow Six is Counterstrike’s sexier cousin. In many ways, Rainbow does inherit some of the same tactics from its meta. Crouching and leaning, and reducing your visibility to an enemy is essential. Pros hold corners tightly. Observe the movement of pixels rather than entire character models that cross your field of view. Expose your operator as little as possible. Gain information on your opponent through ambient sound, cameras, and other special abilities that Rainbow Six’s operators provide (e.g. Pulse’s heartbeat monitor, Lion’s EE-ONE-D, or Dokkaebi’s Logic Bomb). Tactically, Rainbow Six is a game of information. Seeking that information by rushing into open areas without prior knowledge cedes initiative to your opponent. Initiative, or the ability to engage first before your opponent can, is key to winning firefights. Once engaged, battles last only seconds. If you’re good, fights are over before the enemy has a chance to even return fire. Anticipation is everything in Rainbow Six. Use the small clues the game drops to anticipate movements. Even shadows generated by the environment can tip you off to an opponent’s location. Being a quick aimer is different from being smart aimer. If you know the direction and general area your opponent is in, you can pre-fire down corridors or around corners. Keep that last lesson in mind — you also do not want to give your opponents the kind of information that allows them to anticipate you. Sound reveals a great deal of information. Sprinting is one of the noisiest behaviours in Rainbow Six. Avoid it when you have the luxury of doing so. Keep discipline with your weapons. Unless you’re pre-firing with solid information, gunfire can let your enemies know your location more so than footsteps. Stationary targets make for easy headshots. Although Ubisoft has committed to reducing crouch and lean spam, you will want to always keep moving, crouching, and strafing in engagements. Practice how to track targets while also pressing your movement keys. If caught in a direct firefight, strafing left and right while laying down fire on a target is imperative. Use natural cover in the maps to duck behind as you reload and plan your next move. Duck frequently in and out behind that cover to throw off your opponent and give yourself critical protection. Rainbow Six’s weapon and gadget loadouts are balanced in favor of the attacker. Attackers have more powerful and accurate rifles, less recoil, and almost total access to the ACOG optic. Defenders mostly have access to weapons that excel at CQB, such as shotguns and submachine guns. What defenders lack in damage and range, they make up for in fire rate and recoil, and therefore thrive in close quarters combat. With rare exceptions, like Jager’s HK-416, defenders will almost always be at a disadvantage in longer range engagements. Rainbow Six’s customisation offer some degree of choice over how your aiming profile looks and acts. For some, the added magnification of the ACOG scope is essential to staying accurate and pulling off critical headshots in engagements. For others, the added shake and recoil of the ACOG can be distracting, finding it easier to use the unmagnified Red Dot, Holographic, or Reflex sights. Choose the sighting that is most comfortable for you. Never feel like you’re second guessing the outcome of a match because you felt that your sights were off or forced you to miss a shot. Although being sharp with your senses and instincts helps, don’t forget that Rainbow Six isn’t a free for all. Head to head engagements can turn on whether your teammates are able to give you intel regarding the location of your opponents. Even when dead in ranked or casual, your teammates can watch cameras and give in-game voice callouts to enemy locations. Even if your team is silent, it never hurts to ask (or plead). If someone has been knocked out of the round, diligently watching cameras can be a huge help. Tactics and knowledge can only get you so far. Aim will always be a critical component of winning at shooter games, and Rainbow Six is no different. No matter how well-trained in tactics you are, as you climb the Ranked ladder, your opponents will only get faster and more disciplined. Quick and accurate fire is a way to bail yourself out of mistakes. While the time to kill in Rainbow Six is very short, being able to “flick” your aim and make quick turns on potential ambushers can make all the difference.